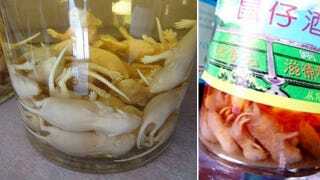 China is known for its delicious rice wine, and while Korea's mice wine sounds very similar, its made with extra ingredients that sound downright disgusting. What you see floating at the bottom of those bottles are actually dead baby mice, which supposedly imbue the drink with medicinal properties. According to the folks at Always Foodie, the exact origins of the wine are a little sketchy—it could be Korean or Chinese—but what's for certain is that making the wine is a very detailed and specific process. The baby mice can't be any more than two or three days old, and have to be hairless with their eyes still closed. And once fifteen or so are selected, they basically have to be drowned in a bottle of rice wine which then has to sit and ferment for twelve to fourteen months. The results apparently taste not dissimilar to raw gasoline, and those who've tried it claim that just a couple of cups is enough to get you as high as a kite. And that's probably why the recipe, which is thought to have been first used in ancient Korean or Chinese cuisine, is supposed to cure any ailment. Who's going to feel anything—bad or good—after they've had a sip of this awful-sounding concoction?